The grass covered floodplains are ideal for them and the boars grow to massive proportions of up to 140 kg. They are a truly wild animal with several natural predators, mainly Crocodiles and Dingoes and as a result they can be quite aggressive especially when cornered or wounded. 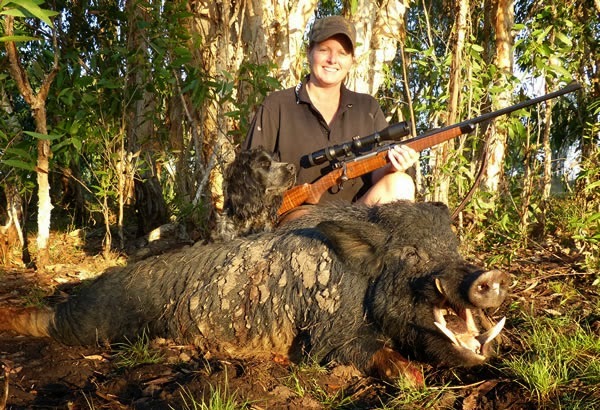 Wild boar hunting is most productive in the early mornings and late afternoons on the flood plains. During the heat of the day boars can be flushed from under heavy brush and can make for close range shooting and exciting hunting. The quality of the trophy tusks at Carmor Plains is exceptional and the lower tusk length ranges from 15cm-25cm (6″-10″). To date, the best wild boar tusks taken at Carmor Plains, (2005) were 30cm long! Carmor Plains is a Photographer’s paradise, providing you with endless subjects. Wildlife such as crocodile, kangaroo, wallaby, goanna and countless varieties of wetland and forest birds are always willing to present themselves along the way. Wild Boars at Carmor Plains can weight up to 140 kg. The lower tusk length of ranges from 15cm-25cm (6″-10″). To date, the best wild boar tusks taken at Carmor Plains, (2005) were 30cm long!